Posted on November 13, 2013 - Get free updates of new posts here. This article originally appeared on Stop Press. Remarketing is a growing marketing strategy which a number of companies are not yet utilising, but should be. Essentially, remarketing is the process of re-engaging your target audience who have had contact with your website through past marketing campaigns, but have not yet converted. It is an extremely effective way of increasing your sales or leads generated online, as your audience is highly targeted and already receptive to your brand. There are a number of companies that offer remarketing. Unsurprisingly, however, it is Google and Facebook that dominate this market and have the most effective platforms. Both services work by placing an unseen code on each page of your website. As each visitor navigates your website, they are tagged and added to your remarketing pool with a cookie added to their computer. The cookie lasts up to 540 days, giving you ample time to convert them into a customer. Building a remarketing audience is very similar to email marketing, with the main difference being that instead of focusing on adding subscribers to your email database, the focus is adding people to your remarketing pool. 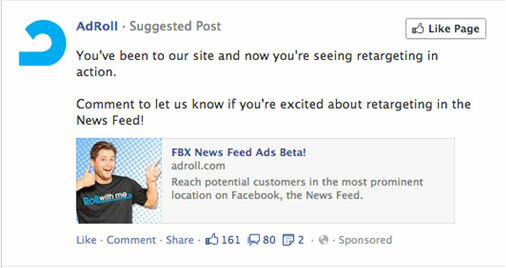 An example of newsfeed remarketing on Facebook by Adroll. Once your remarketing code has been implemented on your website and you are building an audience you can start the marketing process. There are a number of brands that do remarketing well and each has one thing in common — they remember that each visitor is already interested in their product or service and they ensure that their advertising is tailored to that visitor precisely. 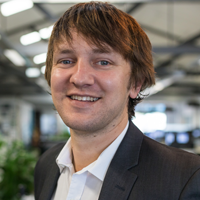 One example of a brand that utilises this strategy well and likely has a very impressive ROI is Webjet. If you have searched for a flight recently with Webjet you may have noticed their advertisements following you afterwards. Essentially they tag each visitor to their website with exactly which flights they are searching for and keep showing you these flights via the Google Display Network to tempt you back to their website to book. 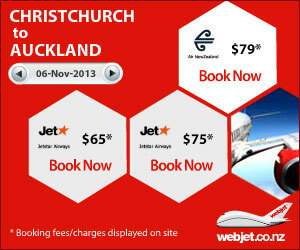 I recently did a search for flights from Christchurch to Auckland. See below the advertising I saw. This is very effective as seeing these banners just before I am about to book will make it far more likely that I go back and book and Webjet. There are a number of reasons why every company should be using remarketing. One of the most important is that not everyone who visits your website will be ready to convert to a sale or a lead right there and then. If you let these visitors leave your website with no remarketing campaign in place there is a very good chance you will lose them altogether — either they will get distracted and not end up purchasing at all or they will begin their search again in a few days and not come across your brand. Using remarketing ensures that for every dollar that is spend on driving visitors to your website you will have increased chance of converting them into a sale, increasing your overall ROI. Another key reason is the ability to push offers or sales to your existing customer database for up to 540 days. This means that whenever you have a sale or launch a new product you can instantly let previous customers to your website know about it. Remarketing also makes smaller companies seem bigger and more successful as your prospects will see you advertising all over the internet — an effective way to close a deal. For every new or innovative marketing idea there will be some people that don’t like it or who find issues with it. One reason that brands choose not to use remarketing is because they feel that repeatedly showing their advertising to potential customers will hurt their brand rather than help it. There is however a solution for this, both Google and Facebook offer the ability to limit the number of times your advertising is shown to each website, by day, week or month. Once you have mastered the art of remarketing to your website visitors, it doesn’t end there — there are also ways to insert the codes into your email newsletters or app. You can even take it a step further and use dynamic remarketing where adverts are automatically generated based on the products customers view in your e-commerce store. This ensures that the adverts are as targeted as possible which maximises conversion rates and keeps you ahead of your competition. Now that you know about remarketing you will start noticing innovative brands utilising this exciting and effective marketing medium — hopefully it will get you thinking about how to implement this strategy for your own business.